Creative Suite 6 or Creative Cloud: Which one is best for you? Adobe has its head in the cloud and it wants you to, as well. That's because Adobe sees the cloud as the future—its primary delivery system for software, services, social networking, community, and ultimately, increased value to its customers. The buzz around Creative Cloud, which began last fall, has gained momentum as its designated launch time approaches—within the first half, and before the summer of 2012, at a date yet to be announced. Meantime, Adobe has also confirmed that a new upgrade of its massive Creative Suite will also be released at the same time. With the launch of Creative Suite 6 now on the horizon, Adobe is tying its major product line into its overall cloud strategy. Not only will Adobe CS6 be released simultaneously with the new Creative Cloud, it will constitute the main component of Creative Cloud. With Adobe is gearing up for a fresh Creative Suite extravaganza, there’s an open question for all creatives: Stick with Creative Suite or take a chance on Creative Cloud? 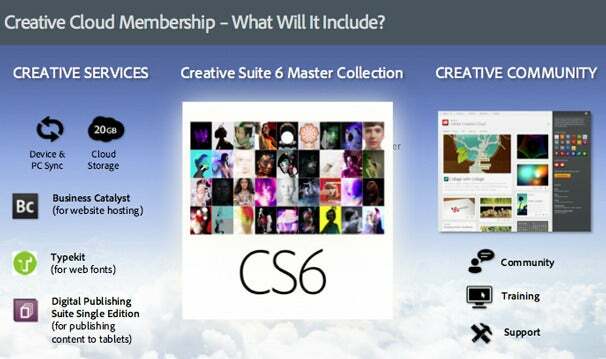 Adobe sees the Creative Cloud as Creative Suite 6 with benefits. It will include new products and services, new features as they become available, and new resources to assist creatives in defining effective workflows. Eventually, it will also offer tools for sharing, training, and community. Adobe sees Creative Cloud as a vehicle for solving the creative community's digital publishing dilemma and helping users effectively deliver content to every medium. For that task, desktop tools alone are no longer going to cut it. “You can't just wrap up everything in a box and ship it on a disk—that’s not the way it works because specs and standards change rapidly," said Scott Morris, senior marketing director of Adobe's creative pro business. "The subscription-based model lets us deliver innovation the moment it's ready—a lot happens in a year.” Adobe will continue to offer the boxed Creative Suite (and a raft of other programs too), increasingly, it will highlight the advantages of the cloud and encourage users to make the switch. At launch, Creative Cloud will offer 20GB of online storage, the suite of Touch tablet apps (now available for Android, and still not universally available for iOS), and the iOS exclusive Digital Publishing Suite Single Edition for iPad that Adobe released alongside the Touch apps. The Single Edition lets freelance designers and small companies create one-off titles with InDesign CS5.5 for sale and distribution via Apple’s App Store. Adobe's mobile Touch apps are all available on the Android OS. However, to date, only Photoshop Touch and Adobe Ideas are available for iOS. The upcoming Creative Suite 6, by itself, will look familiar. Everything users have come to expect about it will be there: targeted suite offerings with multiple applications targeted to graphic designers, Web designers, and videographers, plus a master collection. All of the apps will be updated to offer new features, improvements, bug fixes, and showcase specific user requests. Prices will be comparable. The power of the cloud comes with the combination. With Creative Cloud, Adobe also attempts to answer ongoing pricing concerns. While users have increasingly questioned Creative Suite's high prices and aggressive upgrade schedule, Creative Cloud is priced to move. With a year’s subscription, Creative Cloud will be available to individual designers and artists for $50 per month ($600 annually), and later to creative teams for $70 per month ($840 annually). With the subscription, you get access to the entire Creative Suite 6 Master Collection, 20GB of online storage, complete device to computer sync capability, services like Business Catalyst for Web hosting and Typekit for Web fonts, the Digital Publishing Suite Single Edition, all the mobile Touch apps, and eventually, services such as community, training, and support. If you want a month-to-month contract, it will cost more, though exact pricing has not yet been determined. Team subscribers will get features that individuals do not, such as collaborative workspaces and IT controls. Those who need more than 20GB of online space can purchase it. Whereas with the traditional license you get two copies per license for a single platform, the subscription lets you download both Mac and Windows versions. Remember last year's controversy over interim updates that accompanied the introduction of subscription pricing? That's over. Adobe is now folding that mid-term update strategy into Creative Cloud. The software component of Creative Cloud is not just the Creative Suite. It will also include such non-suite tools as Edge, Muse, Acrobat, and Lightroom. Business Catalyst, Adobe's Web hosting service, lets you quickly use Muse to build a site and host it on Adobe’s server. Muse, the Web development tool that will emerge from beta and launch as a standalone product alongside CS6, has always been planned as subscription only. You will be able to subscribe to Muse by itself or get it via a subscription to Creative Cloud. Note that the 20GB of storage space that comes as part of Creative Cloud is separate from Muse's Web hosting space via Business Catalyst. Adobe is still considering the pricing details for Muse. Despite the benefits of Creative Cloud, some people will not need it. Those who use one program exclusively, and who are not interested in the social networking or training benefits of the community, will likely do just as well with the traditional license. However, they will have to wait for a shrink-wrapped upgrade for any updates to their package. Adobe also plans a video training module for the cloud that would help creatives learn new aspects of the suite. This would be a basic level of video training, delivered on-demand by top tier training providers so Creative Cloud members can avoid paying additional subscription fees to third-party vendors. This part of Creative Cloud is still in the evaluation stage, and no agreements have been inked yet. “This is limited training. We won't want to compete with Lynda.com, but partner with them, to provide what makes sense,” said Morris. There's no single easy answer, no one way to look at the Creative Cloud offering and make a hard judgment about what is right for everyone. However, customer feedback over time appears to have nudged Adobe in the direction of offering many value-added incentives to encourage people to at least consider the Creative Cloud—and these are indeed compelling. Linking the entire Creative Suite to the cloud, and making updates perpetually available at a reasonable price, sounds attractive, especially if it's targeted to non-technical creatives and paired with non-CS6 products such as Muse, Edge, Lightroom, and Business Catalyst. For artists and designers who need tools like Illustrator or After Effects only occasionally, there's no decision needed on whether to spring for an expensive program to cover those contingencies. With a Creative Cloud subscription, you can download and use any program you want, anytime you want, at no extra charge. 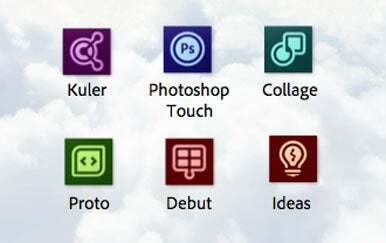 Adobe is counting on the social networking and training components of the Creative Cloud to be a big draw. With the Community, you can show your work, have it critiqued, follow designers you like, and have backup and support as you work through your projects. "Creative Cloud is the creative hub where you get tools, services, and inspiration and where everything is tied together," Morris said. Native support of popular formats. 2 GPUs qualified for hardware acceleration. No playback frame rate display. High-end system needed for best performance.